In sentence correction, the mistakes related to articles are very tricky. 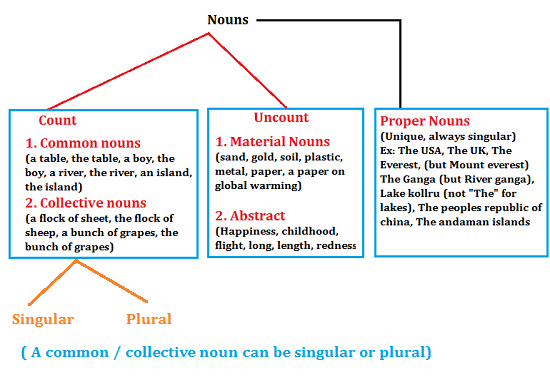 Firstly look at the classification of nouns. A noun is definite if it refers to something specific that is known to both the writer/speaker and the reader/listener. For example, if Gopal needs physics text book, he might ask his friend, “May I take the text book?” He uses the definite article “the” because both he and his friend know which book Gopal is referring to. But If Gopal said to his friend, "I saw a terrible accident this afternoon", here we must use indefinite article 'a' as his friend does not know anything about this accident. The following Table gives clear idea about four possible conditions involved in identifying a noun is whether definite or indefinite. There are five principal ways by whcih a reader can know about the definiteness of the noun whcih is being referred. I saw a terrible accident today. [first mention, indefinite]. I have never seen such an accident in my life. [second mention, accident in general]. The accident made me really afraid. [Third mention, definite]. 2. A superlative degree or ranking adjective makes the noun's identity specific. 3. The noun describes a unique person, place, or thing. 4. A modifying word, phrase, or clause follows the noun and makes it clear which specific person or thing you are referring to. Note: But not every noun that is modified in this way is definite; it depends largely on the situation and on what you can reasonably expect your listener/reader to know about. Do you remember the girl who got selected for TCS? Using the here implies that there was only one girl who got selected for TCS and both speakers might not be known about any other girl selected for TCS.Otherwise the clause who got selected for TCS would not be sufficient to identify the particular girl that you are referring to. If there were two girls, then you would have to be more specific, saying perhaps “Do you remember the girl from Vijayawada who got selected for TCS?" Suresh is reading a book about Networking. 5. The context or situation makes the noun’s identity clear. Count nouns are the largest group of nouns. They denote entities which are treated as units. They refer to objects, people, abstract entities, etc. which are seen as easily counted (e.g. leaves, cups, footballers, cousins, results, ideas). Count nouns are also known as countable nouns. Count nouns are singular and plural. One way to determine whether a noun is used as singular or plural, is to ask yourself whether you could put the number “one” in front of it. For example, you can say “one experiment,” but not “one knowledge” or “one examples;” therefore, “experiment” is singular, whereas “knowledge” is uncountable and “examples” is plural. Rule: If a count noun is used as a singular noun, an article is necessary. The man in the red dress is my uncle. “man” and “red dress” are singular because we are referring to only one man and one red dress. “man” is definite because the following phrase, in the red dress, makes it clear which man we are referring to (reason 4, above). (However, it could be indefinite if there is more than one man in the red dress that the speaker could be referring to; in that case, the speaker would say “A man....”). Is the noun definite? No: Use “a” or “an” Raja bought a rain coat, a pair of shoes. They could be definite if the listener/reader had seen Raja's rain coat, and shoes or if they had been mentioned before. However, the speaker/writer's choice of the indefinite article “a” for both nouns tells us that they are unknown to the listener/reader. Un-countable nouns ( Only takes "the" or no article) denote things treated as non-divisible. They refer to entities which do not have clear boundaries (e.g. cheese, music, sand, water, love, advice, air, progress, homework, ice, coffee). They show no contrast in number between singular and plural. Some things that English treats as non-divisible are easy to perceive that way (e.g. sand or water) but English also treats as non-count things such as luggage, money, furniture, which are composed of elements which can be counted (e.g. someone’s ‘luggage’ may consist of two cases and a bag; ‘money’ may consist of six coins and two notes) but which are treated as single indivisible entities. Count and un-countable nouns are not mutually exclusive terms. Many nouns have both count and non-count uses. “documentss” is plural (ends in -s) because we are talking about more than one document. It is definite because the following phrase, that I gave you, makes it clear to the reader/listener which reports you are referring to. “Rice” is uncountable (you cannot say “one rice”). It is definite because the following clause, that is produced in Punjab, makes it clear which rice you are referring to. “articles” is plural (note that it ends in -s). The lack of an article in front of it means that the speaker/writer is talking not about particular reports that are known to the listener/reader, but about all long reports in general. India's major exports are Tea and Cotton. (uncountable and indefinite). “Cotton” and “Tea” are both uncountable nouns (you cannot say “one cotton” or “one tea” in this context). They are indefinite because they refer to these two substances in general, not to particular shipments of tea and cotton that are known to the reader/listener. The rules pertaining to usage of articles for proper nouns are complex. Usually we dont use any article for singular definite nouns. Singular geographical names are very irregular with respect to article usage. For example, singular names of continents (Asia, Africa), mountains (Mount Fuji), and bays (San Francisco Bay) do not take the article “the,” but regions (the Crimea), deserts (the Sahara), and other geographical entities do. You have to be sure that your reader or listener has the same context or situation in mind that you are thinking of; otherwise, he or she will be confused by your use of the. For example, one student wrote the following sentence. This magazine helps women analyze the problematic situation and offers possible remedies. But this was the first time she had mentioned a problematic situation. Her readers were therefore confused, because her use of the word the implied that they were already supposed to know which problematic situation she was referring to.